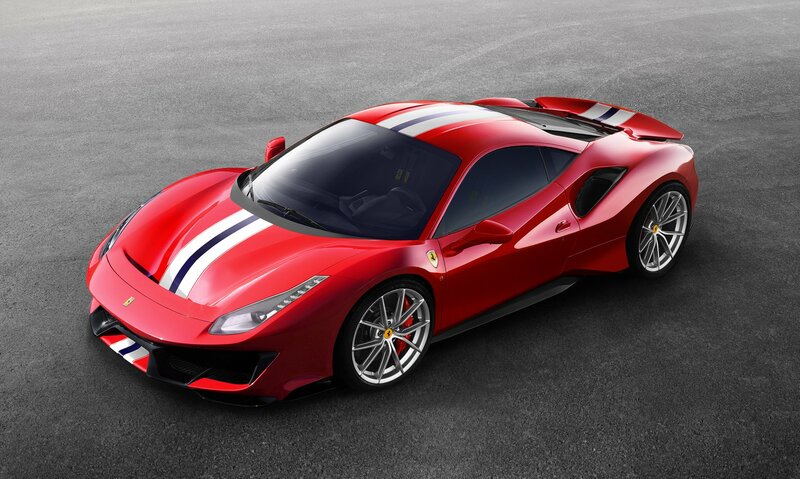 The Ferrari 488 Pista is powered by the most powerful V8 engine in the Maranello marque’s history and is the company’s special series sports car with the highest level yet of technological transfer from racing. In fact the name, meaning ‘track’ in Italian, was chosen specifically to testify to Ferrari’s unparalleled heritage in motor sports. Technically, the Ferrari 488 Pista encompasses all of the experience built up on the world’s circuits by the 488 Challenge and the 488 GTE. For over 25 years, Maranello has been organising the most prestigious of all one-make championships, the Ferrari Challenge, in which over 100 drivers split into three continental series do battle at the wheel. 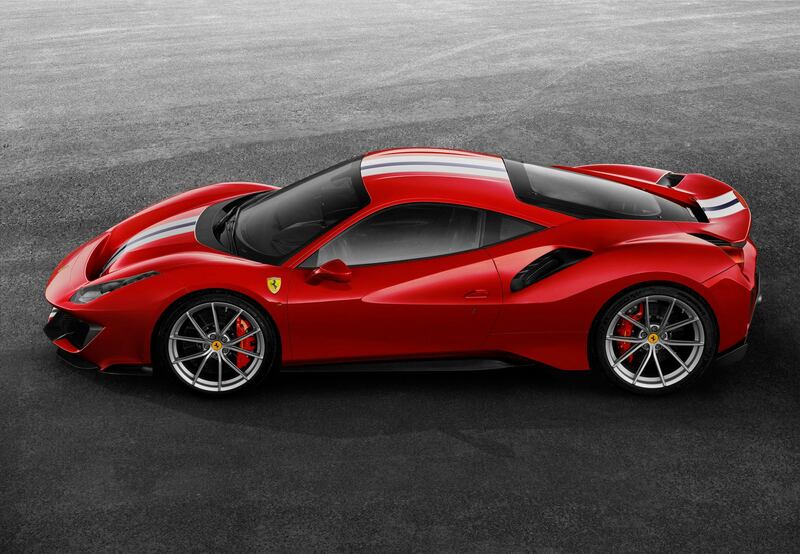 Last year saw the introduction of the 488 Challenge, the first model in the series to be equipped with a turbo engine. The Ferrari 488 GTE is instead the car fielded in the FIA World Endurance Championship, the pinnacle of GT racing, where it has won two consecutive GT Manufacturers’ titles and no less than five titles in total since the championship’s inception in 2012. Thanks to wins in both the Pro and Am categories, the 488 GTE has taken no fewer than 35 out of the 50 races run to date. The new car’s engine adopts numerous solutions from that of the 488 Challenge and its power output has been increased to 720 cv. It is also lighter, thanks to new titanium con-rods and carbon-fibre intake plenums. The inverted radiator cooling system is also derived from the Challenge with the radiators raked rearwards (rather forwards as in the 488 GTB), improving cooling and maintaining optimal performance levels even in high thermal stress situations. The car’s aerodynamics are derived from both the 488 GTE and from Formula 1, specifically the S-Duct at its front, the rear spoiler and diffuser profiles which boost efficiency by 20% compared to the 488 GTB. Other solutions have been carried over from the track to shave off further weight, including the lithium battery (from the 488 Challenge) and also the new carbon-fibre wheel rims - a first for Ferrari. 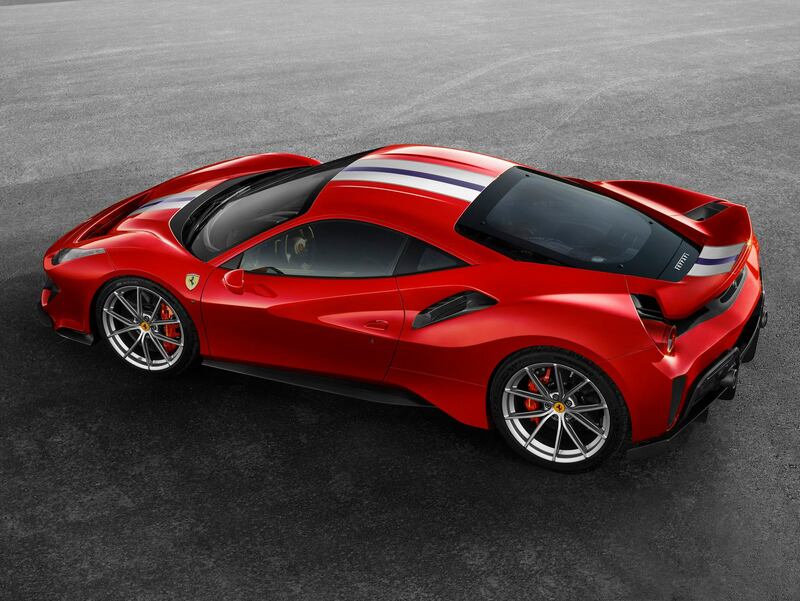 The overall result is that the 488 Pista is an impressive 90 kg lighter than the 488 GTB. 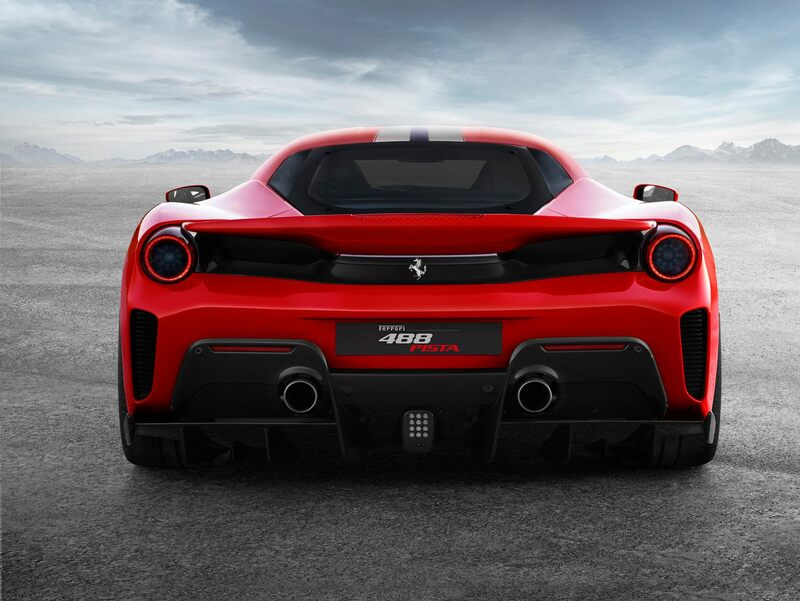 As with the three previous special series, the Challenge Stradale, 430 Scuderia and 458 Speciale, this new berlinetta is the perfect marriage of extreme performance and track car-style handling. The vehicle dynamics were designed for unique driving feedback and to make the car’s full potential available to all drivers, professional or otherwise. Specific vehicle controls were developed with this in mind, first and foremost being a new oversteer management system usable in the manettino’s CT-OFF position and designed to make the car’s performance on the limit easier to reach and control. A new gear-shift strategy in the RACE position delivers a far more sporty experience, very similar to that of a track car. 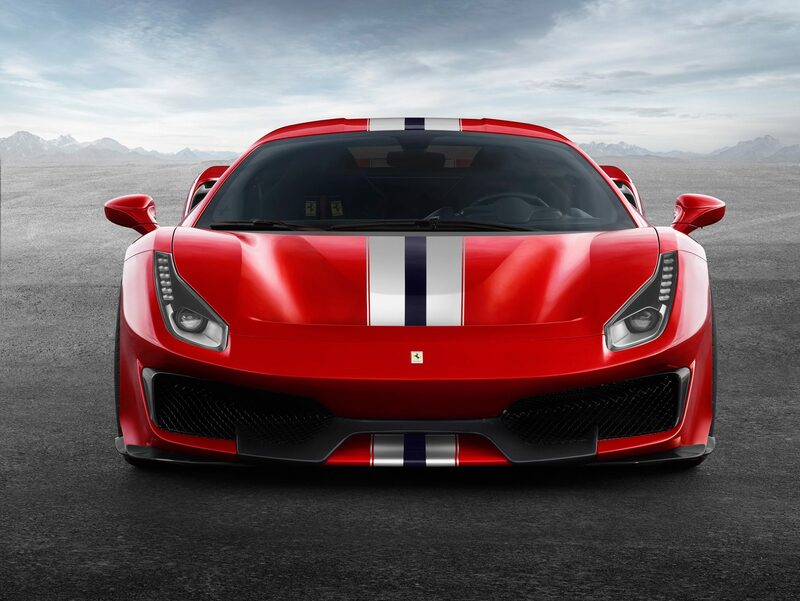 In other words, the Ferrari 488 Pista offers drivers of all abilities an exceptional and exhilarating experience that normally only a competition car could deliver, setting a whole new benchmark in terms of driving pleasure for the Ferrari range. 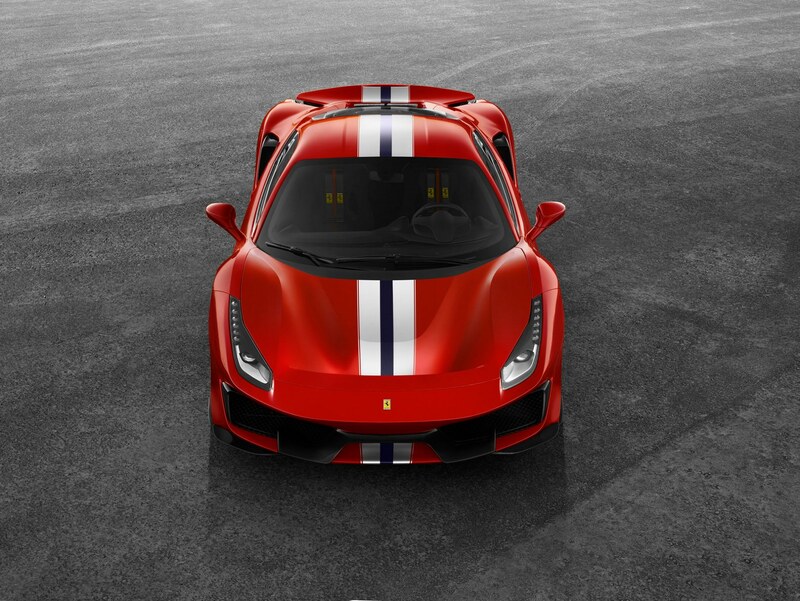 The Ferrari 488 Pista’s extreme design is underlined by the optional livery that highlights the aerodynamic innovation of the S-Duct. 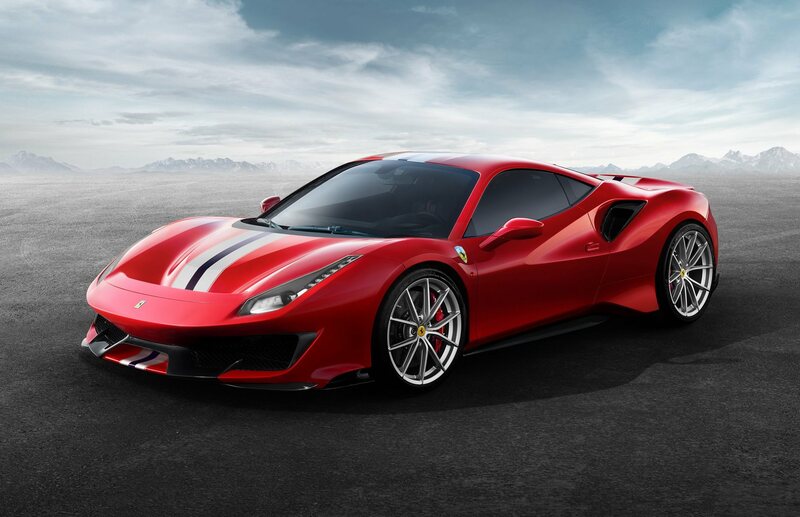 The car’s lines were developed to underscore its sporty soul and cleverly combine the purity of the 488 GTB with some of the hugely successful racing and functional elements of the 488 GTE and 488 Challenge while staying true to Ferrari’s traditional styling. 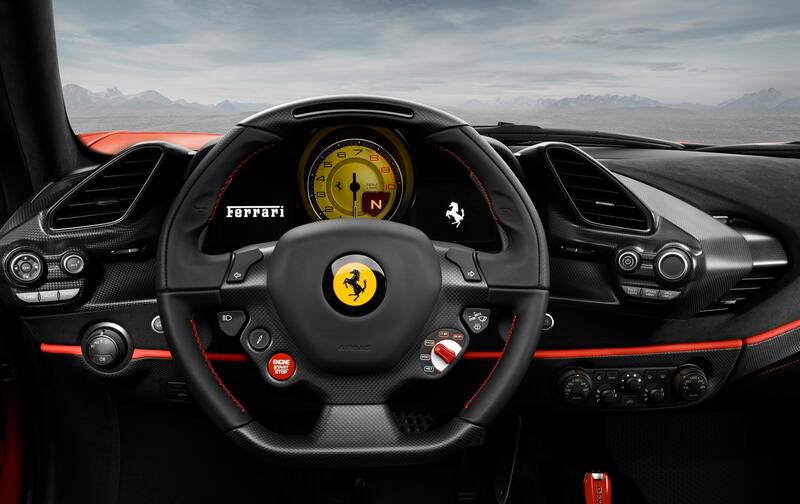 The Ferrari 488 Pista can punch out 720 cv at 8000 rpm, giving it the best specific power output in its class at 185 cv/l, while torque is higher at all engine speeds, peaking at 770 Nm (10 Nm more than the 488 GTB). An extreme evolution of the turbo engine elected overall International Engine of the Year in both 2016 and 2017, this is the most powerful V8 in Ferrari history. The sporty driving feedback is further enhanced by the high-performance gear shifting, typical of a thoroughbred race car. The new gear shift strategy, available in the manettino’s RACE position, reduces shifting times by 30 ms with positive acceleration when the higher gear engages that the driver can feel distinctly. This model also adopts the hugely successful Ferrari Variable Torque Management strategy for all gears. To adapt it to the car’s extreme sporty spirit, all of the curves were redesigned to deliver a feeling of consistently smooth, powerful acceleration all the way to the red line. 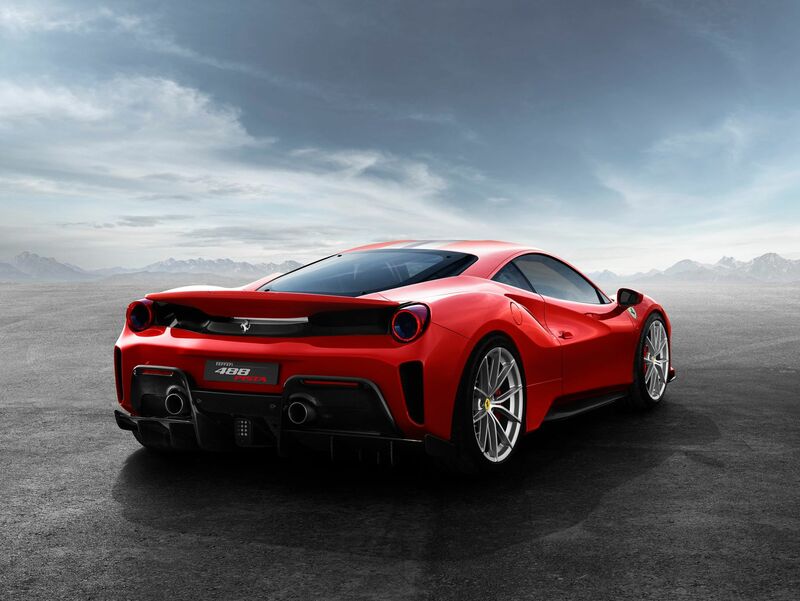 The aim of the Ferrari 488 Pista’s dynamic development was to produce a car that offers blistering mechanical performance in terms of lap times and standing starts, driving pleasure and accessibility of performance to drivers of all types. To achieve these objectives, Ferrari’s engineers had to work on several fronts, starting with introducing numerous lightweight solutions as well as evolving both a new generation of the Side Slip Control System (SSC 6.0), improving the efficiency of the braking system and developing a new specific tyre, the Michelin Sport Cup 2. The Ferrari 488 Pista is 90 kg lighter than the 488 GTB, which brings huge advantages in terms of its agility and responsiveness. To maximise on this, the weight reductions are concentrated in the most weight-sensitive areas of the car, such as the unsprung masses and components away from the car’s centre of gravity. The body shell was designed to keep the car as light as possible and features ultralight materials such as carbon-fibre for the bonnet, the front and rear bumpers and the rear spoiler, and Lexan for the rear window. The exterior sections of the bumper ahead of the wheels were also extensively redesigned with solutions modified from the 488 Challenge and reinterpreted so successfully that they are responsible for 23% of the increase in downforce compared to the 488 GTB. Radical scoops in the front bumper allow aerodynamic elements to protrude in areas where they can be most efficient. The volume of the front bumper extends towards the wheelarch to deflect the flow ahead of the wheels outwards, generating suction from the wheelarch and thus from the front underbody, which is equipped with diffusers, all to the benefit of front downforce. At the rear, two elements contributed to the achievement of the downforce target: the blown spoiler system and the venting behind the rear wheels. The spoiler is higher (+30 mm) and longer (+40 mm) compared to the spoiler on the standard production car. Development work focused on the efficiency of the bleed under the spoiler to adapt it to the change in the car’s overall downforce. The calibrated sections have been optimised and the direction in which the air is blown has been modified: the angle is now upward, aided by the deflection of the flow by the upper surfaces of the spoiler, to generate even more rear downforce. The evolution of the spoiler system and its bleed has had a significant impact on downforce, accounting for 25% of the overall increase compared to the 488 GTB. The increase in drag caused by the new blown spoiler system is compensated for by the shape of the air flows venting from the rear bumper below the tail lights. Furthermore, the vents have been optimised to exploit the pressure field generated by the spoiler to encourage evacuation from the rear wheelarches, increasing intercooler efficiency by 3%, on the one hand, and incorporating the wake from the wheels on the other, allowing the diffuser to be struck by a cleaner, more energised flow, boosting the rear downforce it generates. As is always the case with each new Ferrari, the 488 Pista’s underbody has been specifically redesigned to ensure it delivers as efficient a Cl figure as possible. The first big difference compared to the 488 GTB is how the hot air from the radiators is deflected to the underbody ahead of the front wheels. This choice, made to enhance the cooling layout and lower the car’s drag coefficient, however shrinks the surfaces that can be used to generate downforce. To make up for this and further boost downforce, the designers decided to exploit other areas of the underbody. 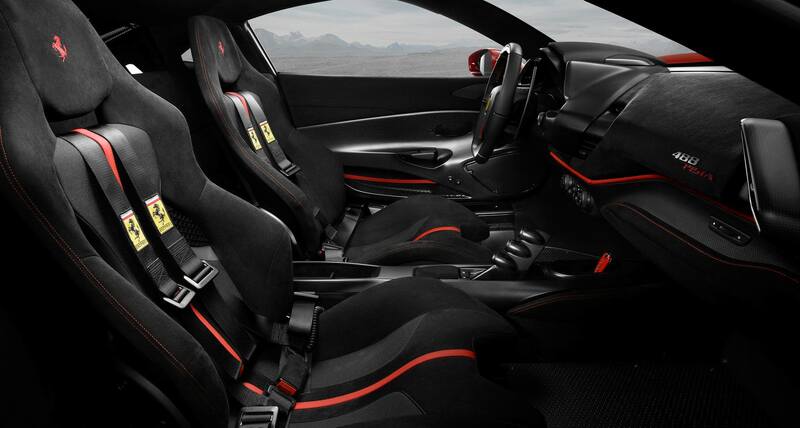 The interior has a distinctive racing feel with all superfluous elements eliminated. The extensive use of lightweight, exclusive technical materials such as carbon-fibre and Alcantara works brilliantly with the meticulous crafting and sophistication that is the signature of all Ferrari cockpits. Contrasting hand-stitching, tread plates and heel rests in triangular pattern aluminium and particularly fluidly sculpted door panels are fine examples of this.